Appendix A. MRC & Shakespeare Marhoff Patent Reel Parts (Based on “What Willy Did to Walt’s Stuff,” a presentation by Len Sawisch at the 2011 ORCA National Convention). 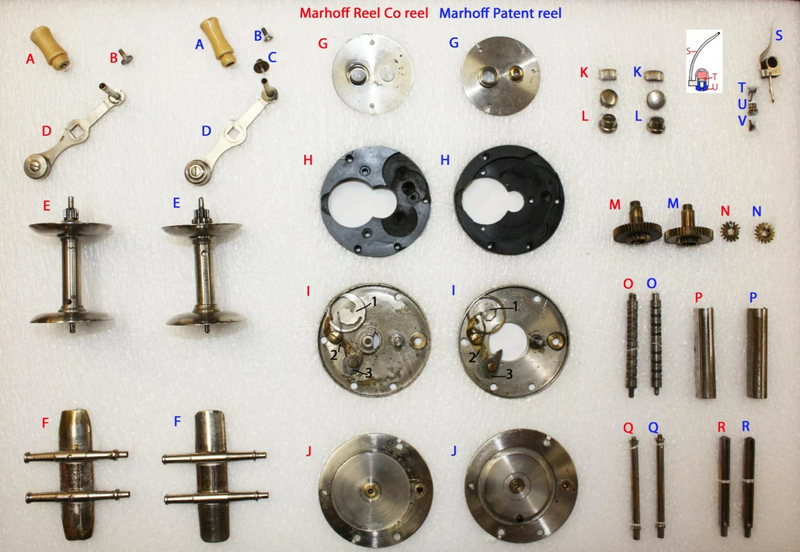 Marhoff Reel Company Reel # 307 parts have RED tags. * MRC reel 307 did not have an original MRC carriage and threaded pawl cup. A colored drawing of the MRC carriage and cup is included. There appear to be only a handful of original MRC carriage and threaded pawl cups in the ORCA/NFLCC community. Where are the rest of the screws? Safely locked away because they are like socks and tend to get lost . . .